Are you seeking a little definition in your optical media projects? Unsure about the differences between CDs and DVDs, or what about duplication and replication? Our glossary is loaded with the latest lingo about printers, duplicators, publishers, and all sorts of optical media definitions and terms. The house brand of DVD/CD duplicator machines built and sold exclusively by US Digital Media. Specialty media from Mitsui / MAM-A that contains a patented Phthalocyanine dye and a layer of gold foil for extreme longevity. The designs layout and graphics that are printed on a disc, an entrapment, an insert, or other printed materials. The process of DVD arrangement and creation. It involves the use of source elements (video, pictures, text) to create menus, tracks and connections between these elements. A device with a robotic arm for loading and unloading discs from a printer or duplicator. A feature of a DVD will play the video first, instead of the menu. The writable form of Blu-ray available to consumers. Writable discs that can be erased and rewritten with new data. A disc that has no information written on the data layer. A term for the printing that goes beyond the edge of the sheet to ensure proper trimming. Bleed is on all sides of your document that gives the printer a small amount of space to move around paper inconsistencies. Block error rate. This is the “raw” digital error rate before any error correction. The maximum number of BLERs allowed on a disc. According to the industry standard, a CD ROM is allowed a BLER of up to 220 before it is considered a “bad” disc. Blu-ray is a high definition optical format developed by Sony that stores up to 25 GB of data per layer. Discs that bear the name of the manufacturer on the surface of the disc. To write/record information onto a disc. Sometimes called Hockey Rink discs, they have two straight edges and two curved edges. Designed to fit in a wallet or specialty vinyl sleeve. A small chamber of ink for use in inkjet printers. Can be single color or multi-color. CD format that is used for including extra information on a CD-ROM/XA track, enabling it to be played on a CD-I or CD-ROM/XA drive. Compact Disc Digital Audio. This format was launched in 1982 and was the product of joint development by Philips and Sony. CD-DA discs conform to the red book standard. The process of 'burning' audio or data files onto a recordable CD. A multisession CD comprising of audio and data. Can be used to add extra CD-ROM content to audio CD releases. The standard was developed by Philips, Sony and Microsoft. Audio CD that contains graphics as well as audio data. The format is usually used for karaoke CDs. Compact Disc - Interactive. A multimedia/interactive CD format that was jointly invented by Philips and Sony. Compact Disc Recordable. An optical disc which data/audio can be written to once. The CD-R was developed by Taiyo Yuden. The process of pressing or stamping data onto a CD from a glass master. Compact Disc Read-Only Memory. An optical disc used to store computer data. 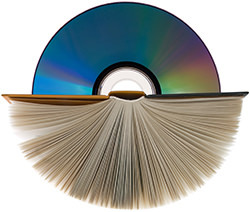 CD-ROM is defined by the yellow book standard developed jointly by Philips and Sony in 1983. CD-ROM Extended Architecture. These discs contain Mode 2 sectors allowing audio and data to be read at the same time. Photo CD, Video CD and CD-Extra are based on this format. Compact Disc Re-writable. An optical disc that can be written with data or audio multiple times. Introduced in 1997 by Hewlett Packard, Mitsubishi, Philips, Ricoh and Sony. A thin plastic disc case available in multiple colors and shaped like its namesake. A standardized method of printing color by using four ink colors—cyan, magenta, yellow and key (black). Often referred to as “process color” or “four color”. This subtractive color model works by partially or entirely masking certain colors typically printed on a white background. SAdjusting colors on screen or at press to meet a desired output from a printer. Printed samples of desired color usually required. A digital storage format that uses a laser, polycarbonate discs and metal data layers for storing and retrieving information. All of the audio, data, videos, pictures, software, or multimedia files to be burned on to a disc. In a stand-alone duplicator tower, this is the device with the screen and buttons that orchestrates the actions of the tower and its components. Protections placed on certain store-bought CDs and DVDs that make them unable to be copied. Using another person's work such as text, images, video, or music, logos or artwork without their explicit permission. Read more about Copyright in our article Basics of Copyright Law. The estimated cost of producing each individual disc, based on the cost of the printer and the ink cartridges or ribbons. (or corner marks) are lines placed at the outer trim point of an image or page to indicate where to trim the image both vertical and horizontal. Usually background images bleed past the crop mark point by 1/8” to allow for slightly off cuts. Removal of unneeded parts of an image, usually outer parts to resize or adjust the aspect ratio of an image. This is a measure of the amount of interference coming from neighboring pit tracks on a CD. As track pitch is tightened (when tracks are packed closer together to put more data on the disc), cross-talk increases. A maximum value of 50% is allowed by Red Book specifications. Content Scramble System. Scheme used to encrypt DVDs so that they can only be played on CSS-licensed DVD players. One type of organic dye used to form the data layer in CD-R discs. Cyanine was the first material used for these discs but presently a metal-stabilized cyanine compound is generally used instead of “raw” cyanine. An alternative material is phthalocyanine. In CD-R, the organic dye sandwiched between the polycarbonate substrate and the metalized reflective layer of the media. Discs do not have any data on them until they have been recorded/burned. Instead, the recording laser selectively melts “pits” into the dye layer—but rather than burning holes in the dye, it simply melts it slightly, causing it to become non-translucent so the reader laser beam is refracted rather than reflected to the reader’s sensors. In pressed CDs, the data layer is part of the polycarbonate substrate and is pressed into the top side of it by a “stamper” during the injection molding process. Creation of artwork or multimedia by design experts. The silver finish on the data layer of certain CD-R's, named for its sharp and clear appearance. Looks very similar to a replicated disc. Specific cuts or shapes of a material used to form a variety of products to exact sizes. Ideal for small runs of reproduction of digital images using ink or toner on physical surfaces such as paper, film, plastic, etc. A digital snapshot of all the information on a CD or DVD disc, saved in a single file called an image. Image files can be stored on a hard drive and burned later if desired. A method of making copies in real time in which the data is written to the blank disc as it is read off the master disc. Discs with read errors will result in burn errors. The process whereby a whole CD is written to without turning the laser off, i.e. there is only a single track burned onto the disc. A reader or writer drive in a tower, or any drive that fits the standard 5.25"-inch width. Dual-Layer discs have multiple data layers on the same side of a disc that can be recorded on. The process of burning content onto a disc(s) with a CD or DVD recorder, such as in a home computer, duplicator tower, or stand–alone recorder. Duplicated discs cannot be made "protected." A machine whose purpose is to produce mass copies of optical discs, including CD, DVD, Blu-ray, and HD DVD. Digital Versatile Disc. A DVD can contain audio, video or data. DVD format used for storing audio data. Has a much higher sampling rate than standard Audio CD's but the format has been slow to catch on with consumers. Replicated single sided, single layer DVD with 4.7GB of storage. Replicated single sided, dual layer DVD with 8.5GB of storage. Replicated double sided, dual layer DVD with 17GB of storage. Sometimes called "Amaray" style and available in multiple colors, DVD cases are available in multiple discs sizes and can hold a printed entrapment on the outside. Some have clips on the inside to hold printed materials. Digital Versatile Disc Recordable Dual Layer. Digital Versatile Disc Re-writable. Developed in co-operation with Hewlett-Packard, Mitsubishi Chemical, Philips, Ricoh, Sony and Yamaha. Digital Versatile Disc Recordable. An optical disc capable of having large amounts of data written onto it once. Digital Versatile Disc Read-Only Memory. Used for storing computer data. A re-writable DVD disc. Can be re-used multiple times. These discs may have compatibility problems with some hardware. An organic compound found in compact discs that crystallizes at a known rate. This is the layer which data is "burned" into. A printing process where specialized films are heated and cooled from a solid to a gaseous state bypassing the liquid state and producing a beautiful continuous tone photograph. This technology is found in the Teac P55 thermal printer. Importing a raw video capture into a computer and adding things like titles, effects, music, and arranging the clips on a timeline to create a finished video. Anything done to obscure the source or content of data, including making it unreadable or indecipherable under certain circumstances. Encrypted files can only be read by someone who is able to decrypt it, often using a software program. The printed insert that goes on the outside of a DVD case. Available in various sizes to fit most any standard DVD case, thin or multi-disc case. A cardboard or padded bubble cushion that covers a disc package completely. Suitable for sending discs through the mail. An upgraded service order completed in 24 to 48 hours. The function of CD and DVD recorders that makes discs playable, telling the disc that no more information can be added or written to it. The set of low-level instructions, stored on a ROM chip, that controls the system hardware. The process of making a disc complete for resale, including direct distribution to customers and clients. May include addressing, direct mailings and scheduled delivery. A special glass disc that is etched with a powerful laser; can be used to make hundreds or thousands of replicated discs in specialized disc replication machines. A fixed, high-capacity storage drive that uses platters and a magnetic read/write head to store and retrieve data. One of two competing high-definition formats supported by hardware manufacturers and led by Toshiba. The recordable format of HD DVD, these discs are available in single-layer (15GB) capacities and dual-layer (30 GB) capacities. The rewritable form of HD-DVD-R. Can be erased and rewritten multiple times. Discs that have a printable surface area extending into the inner ring of the disc. A manufacturing method where molten material is forced into a mold, usually under high pressure, and then cooled so the material takes on the shape of the mirror image of the mold. Media with a white or silver, often rough surface. For use in inkjet printer. A type of printing technology that uses nozzles to spray tiny droplets of ink onto a surface. Higher resolution typically indicates higher quality. The paper products that go into a CD jewel or DVD case, can be panel inserts, tray liners, artwork, or entrapments. A standard sized plastic case that holds a disc, booklet, and tray card insert. Available in black and clear. An optional kit for Bravo II printers that allows finished discs to stack neatly in a plastic hopper. Adhesive stickers that can be run through a printer and applied to the surface of a disc. Acrylic lacquer is spin-coated in a thin layer on top of the metal reflective layer of a CD to protect it from abrasion and corrosion. Usually a decorative label is also applied to the top of the lacquer, but this is not a standard requirement. A xerographic printing process that produces high quality text and graphics on paper by direct scanning of a laser beam across the printer’s photoreceptor. A special type of recordable media where a laser is used to etch text and designs onto the top surface of the disc. Compatible with Lightscribe burners only. Records audio CD's in real time from an input source, such as a camera, tape, microphone, or other audio equipment. Can be cardboard or padded bubble, suitable for sending discs through the mail. The original copy of whatever it is you want to duplicate in its exact form and functionality. Mastering is the process of creating a stamper or set of stampers to be used in the injection molding stage of disc manufacturing. During this process, a digital signal from a computer is used to guide a laser beam which etches a pattern of “pits and lands” (in the case of CDs) or a continuous groove (for CD-Rs) onto a highly polished glass disc coated with photoresist. This “glass master” is then cured or developed with ultraviolet light and rinsed off, and a metal (nickel or silver) mold is electroformed on top. This mold is then removed and electroplated with a nickel alloy to create one or more stampers to be used in the injection molding machine to press data into the polycarbonate substrate of CDs or the guiding groove of CD-Rs. An exclusive disc storage system that uses molded plastic binders and rings to store discs. A navigational element that provides buttons for connecting to other elements in your project, such as tracks, slideshows and other menus. It can have a still or full motion background and include audio. A disc with the same inner diameter as a standard disc, but a smaller outer diameter. Most mini-sized discs are 3 inches across. A printing technique that creates consistent high-quality images where the inked image is transferred to the printing surface (discs or paper) from a plate or rubber blanket. Any type of disc that stores information digitally and is read with a laser. Includes CD, DVD, Blu-ray, and HD DVD formats. A network-capable archival appliance from Primera that backs up emails sent through Microsoft Exchange on optical discs. The Orange Book is a specification for CD-Recordable. The data layer of CD-R discs is made from either cyanine or phthalocyanine dye which is melted during the recording process. Where the dye is melted, it becomes opaque or refractive, scattering the reading laser beam so that it is not reflected ack into the reader’s sensors. The difference between reflected and non-reflected light is interpreted by the player as a binary signal. A sealed plastic wrapping that encases a CD or DVD case, with a folded edge to it. Similar to a cigarette pack wrapper. Pantone Matching System is the system based on printing a specific mix of pigments to create new and more exact colors. Pantone spot colors are the proprietary color space for the selection and accurate communication in printing. Their allocated Pantone number describes the colors, which have a certain pigment value to reproduce the colors in the closest and most specific shade. A duplicator which is operated from or with the use of a personal desktop or laptop computer. Thermally re-transferred from a photo ribbon directly to the surface of the disc. This process gives vibrant images with excellent color consistency throughout printing, and it's completely waterproof. An organic dye used to form the data layer in some CD-R discs. Mitsui Toatsu Corporation holds the patent on this dye but has licensed its formula to some other manufacturers. A sample item, which serves as a test to determine the quality and accuracy of artwork and materials used in manufacture before mass production is started. Making illegal and unauthorized copies of material you do not own, against the law regardless of whether or not you profit from the act. In a “pressed” or mass-replicated CD, the bumps and grooves that represent binary data on a disc’s substrate are pressed into it during manufacturing. CD-R do not have true pits and lands but the unmelted, clear areas and melted, opaque places in the dye layer fulfill the same function as pits and lands on a pressed disc. An all-in-one system that burns data to and prints on the surface of CDs and DVDs. Often connected to or controlled by a separate computer. A service completed in the standard timeframe of three to five days. An estimate of the cost to complete a project. An optical drive that only reads information from discs and cannot write anything to them. The metal layer on top of the dye that reflects the laser beam back to the reading assembly. This is usually 24K gold in CD-R discs but there are also silver discs as well. Discs that are formed in a mold from polycarbonate pellets using a glass master disc to imprint the content of the disc. Replicated CDs and DVDs can be protected against unauthorized copying. The number of pixels that can fit into one square inch. Measured in dots-per-inch (DPI), it is a measure of quality where higher is typically better. The blending of three primary colors (Red, Green, Blue) and a white point to create colors viewed in that color space. This is the color space used by digital cameras, monitors, computer graphics, etc., for previewing on the typical computer display. The RGB color model is an additive combination of primary color on black. A roll of black or colored film used in thermal printers. Read Only Memory. This type of disc cannot have information written to (“burned on”) them. Plastic material that is thermal reactive and will "shrink" to the shape of the product that it is covering. A printing method that uses prepared finely woven cloth patterns to produce high quality color results for printing on discs using spot colors. An element in a project that individually display photos and can contain up to 99 still images with accompanying audio and transitions. A paper packaging solution for CD and DVD discs. Often, they are inexpensive and made of paper, Tyvek, or cardboard. Can have windows to see disc. A DVD or CD case that is much narrower than their standard-sized counterparts. A disc-shaped plastic case that stores discs on a center hub and snaps closed. In a stand-alone duplicator such as an Accutower, it is the main drive that you want to burn FROM. The data bearing removable “dye” used during the injection molding of a CD to imprint pits and lands into the polycarbonate substrate of the disc. In manufacturing CD-R, instead of pits and lands, a continuous spiral is pressed into the substrate as a guide to the recorder’s laser. The stamper is part of a “disc family” created in the mastering process. Any equipment that operates without the need for other equipment such as a computer. The total amount of information that can fit on a blank disc. The optical quality, injection molded clear polycarbonate plastic “bottom” of a Cd or CD-R. For CD-Rs, this layer does not contain “pits and lands” but has a single spiral groove that guides the recorder’s laser. A "super cyanine" dye used in certain Taiyo Yuden brand CD discs that gives them a distinctive blue color. TA standardized document detailing the size and specifications for a finished product. A printing process where colors are applied from ribbons using a print head that applies heat and pressure. Its media has a smooth, glossy printable surface. A measured amount of work done in a certain amount of time. With printers, publishers, and duplicators this is often expressed in the number of completed discs per hour. A small or miniature computer graphic that can contain a static picture or a motion video. Another term used for a DVD/CD duplicator. The black or clear plastic part of the jewel case that has a hub for storing discs. The printed insert that goes behind the disc tray in a standard CD jewel case. A square-shaped flexible disc case made of colored plastic. The length of time required to complete a duplication or replication job, often expressed in business days. An innovative, unbreakable case for storing optical discs. Uses a 3-point trigger system to hold disc. Available in varieties holding inserts or for insertion in binders. Comparing the burned discs to the master disc to ensure data correctness. A flexible thermoplastic used in making clear sleeves for discs. Also called a "burner," these are the drive that write to blank discs and can also read them. The speed at which data is etched into the data layer of discs, usually expressed in terms of "x" or "times." An average DVD recorder can write at 8X or "8 times speed."